Upon arriving in Bagan from Monywa, we immediately proceeded to Phya That Gyi Pagoda, one of the pagodas offering roof access, to watch one of Bagan’s spectacular sunsets. 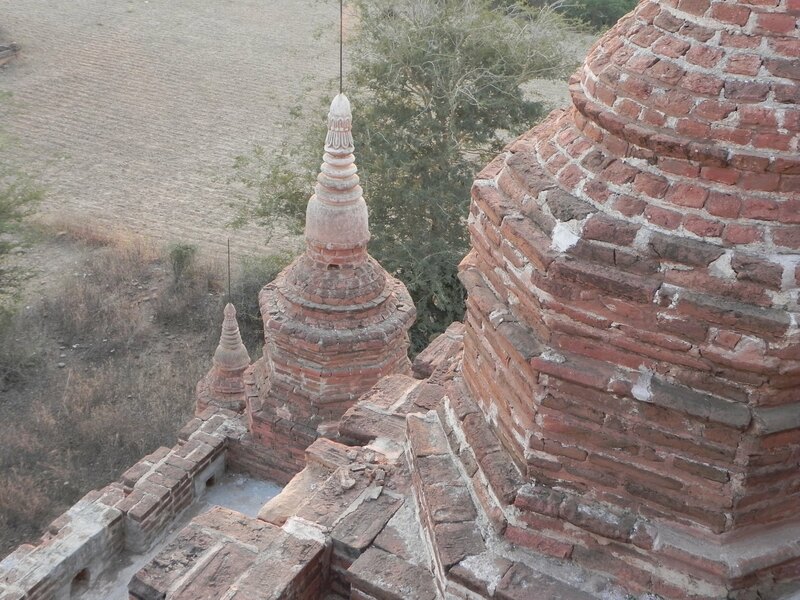 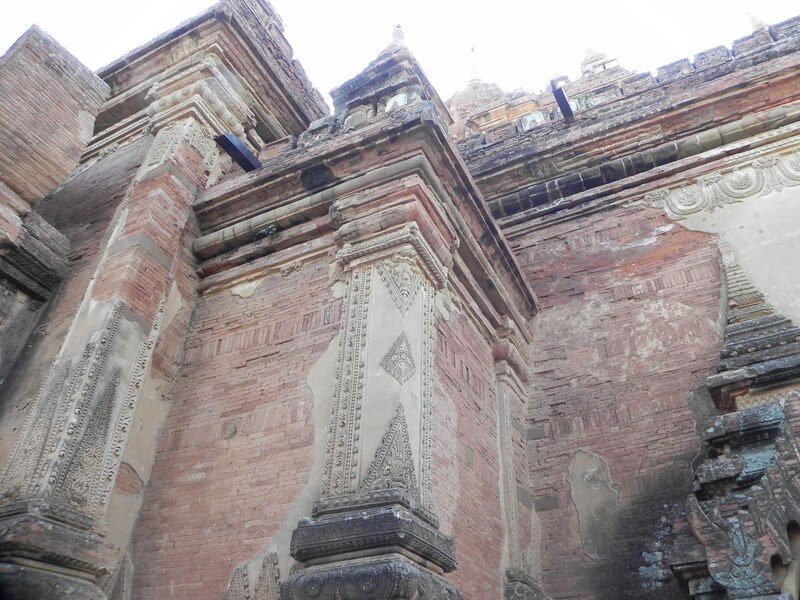 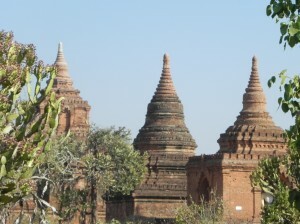 While the multitude of monuments is awe inspiring, there were at one time over 10,000 such structures in Bagan, many of which were destroyed by the Mons or by earthquakes in this region. 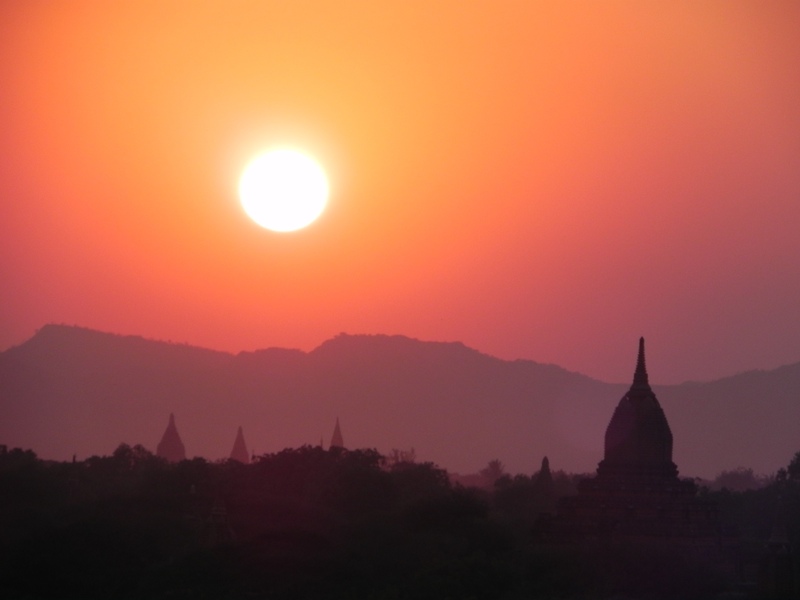 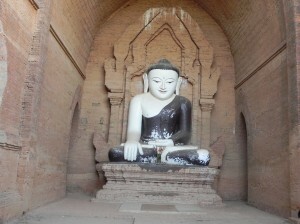 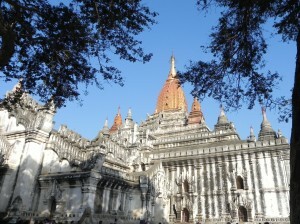 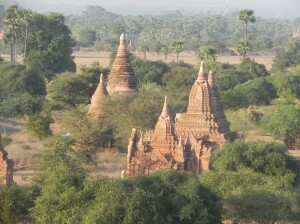 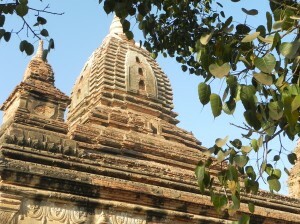 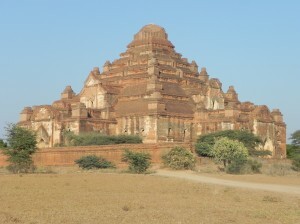 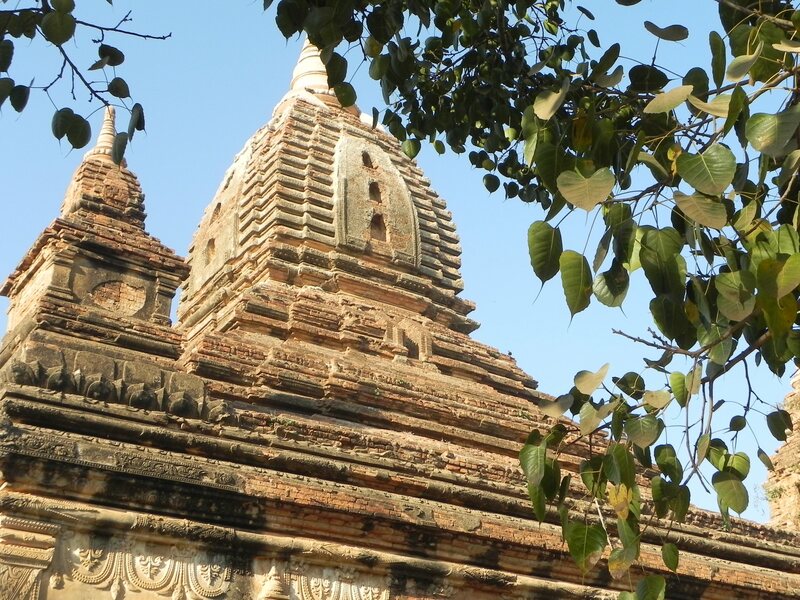 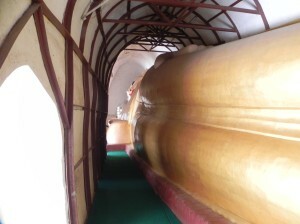 …which is considered one of the four great temples in Bagan. 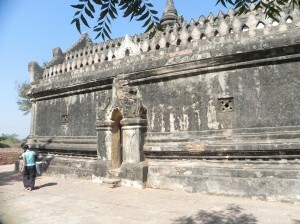 It stands apart from the others due to its whitewashed exterior. 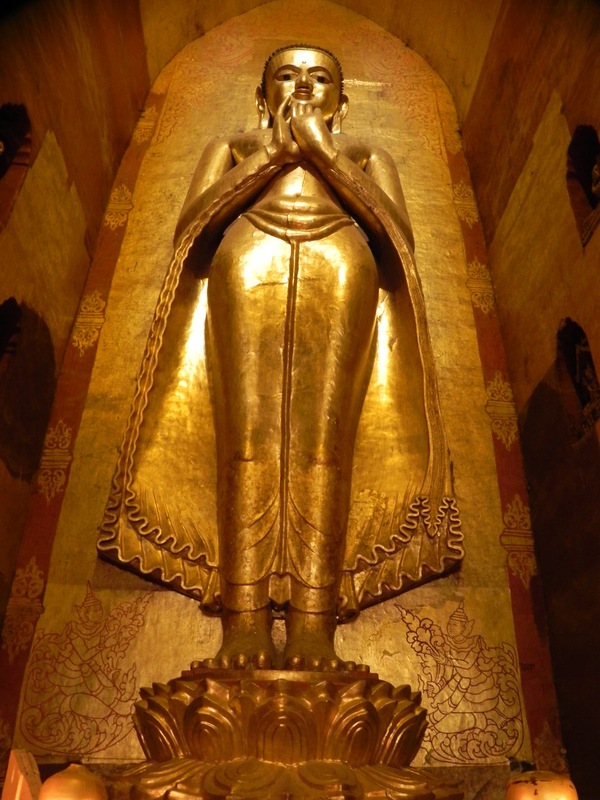 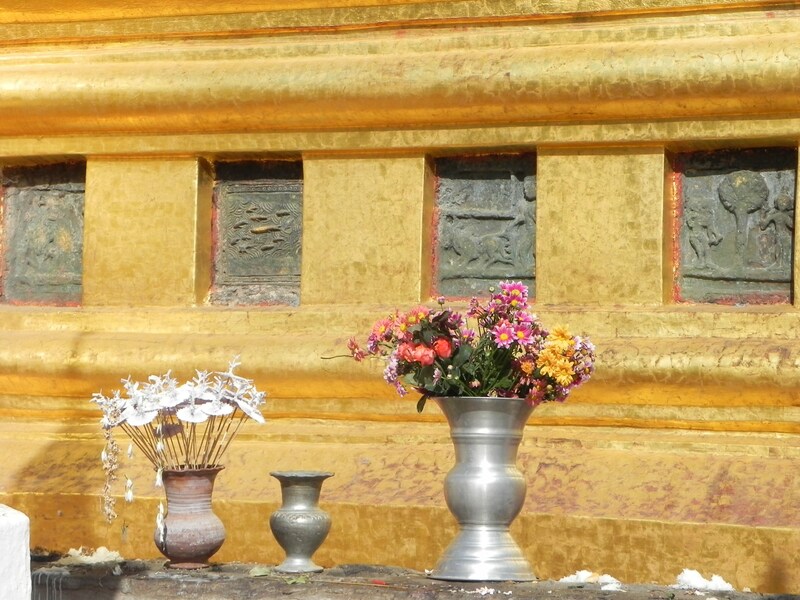 It has four golden standing Buddhas…. …facing east, west, north and south. Along the corridors are over 1,600 tiny Buddha images within little niches. 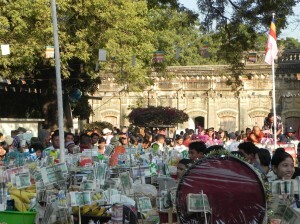 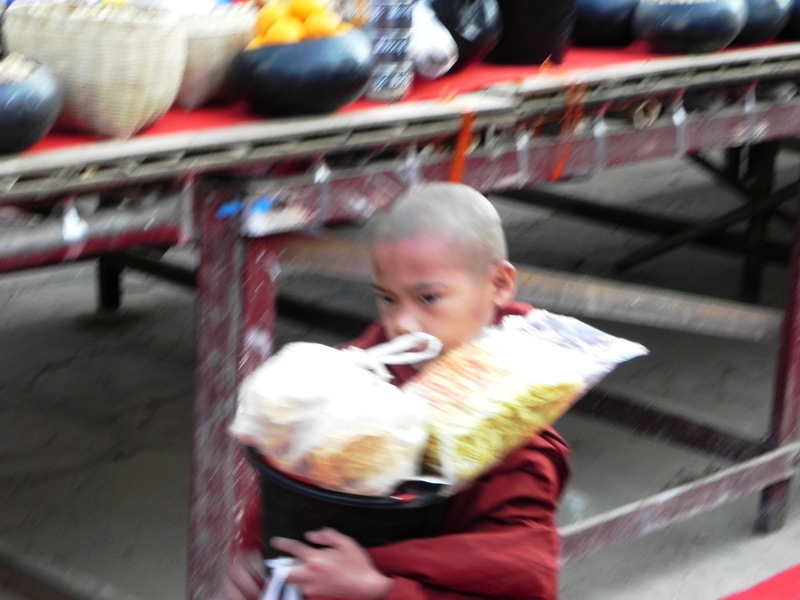 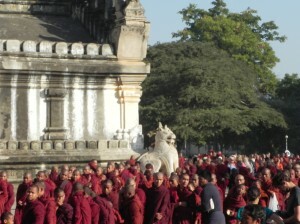 As they proceed through the line, they are handed a bowl with different food items as well as cash for them to return for use by their monastery. 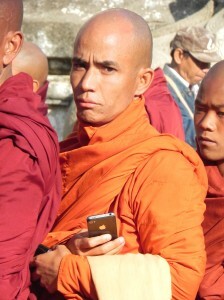 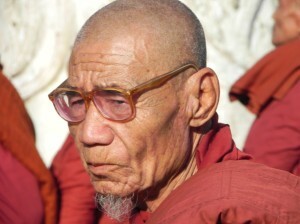 This monk was capturing the event on his iPhone…. 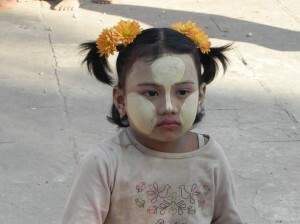 [Thanaka is seen throughout the country used by young people and women as sunscreen and decorative makeup. 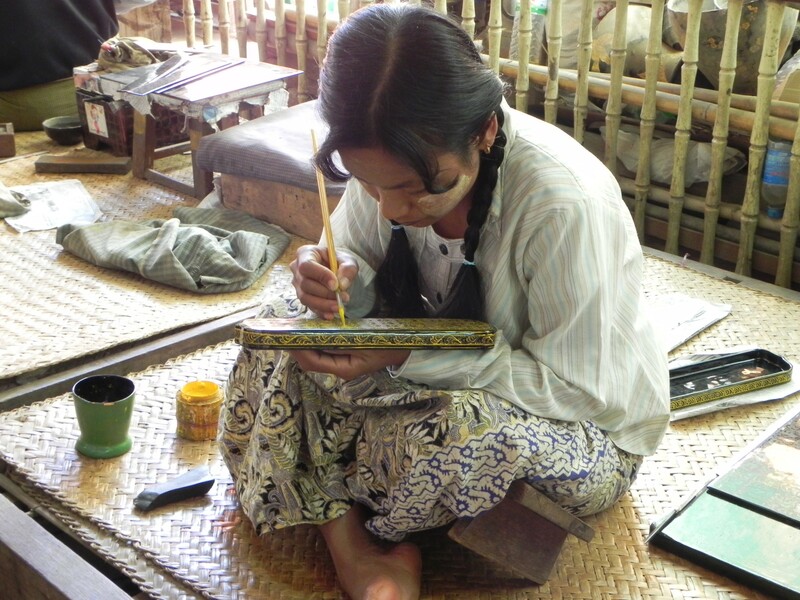 It is a paste made from the ground bark of thanaka trees]. 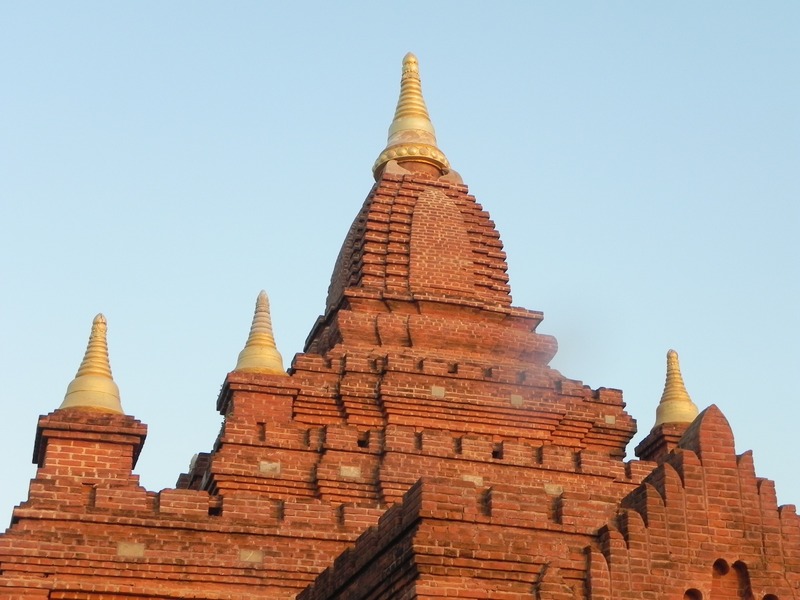 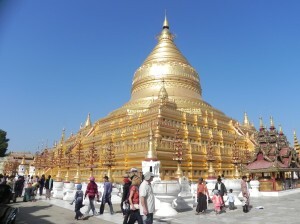 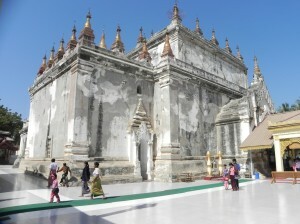 This is the first pagoda built in the Burmese style following the country’s conversion to Theravada Buddhism. 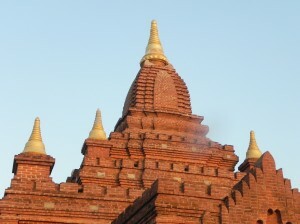 It has five terraces representing the different stages of nirvana. Around the base of the terraces are plagues that illustrate the life of the Buddha. 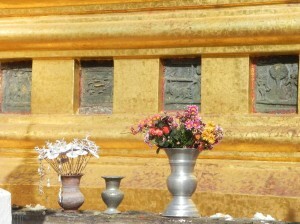 Nat or “spirit” worship is still practiced at this pagoda. 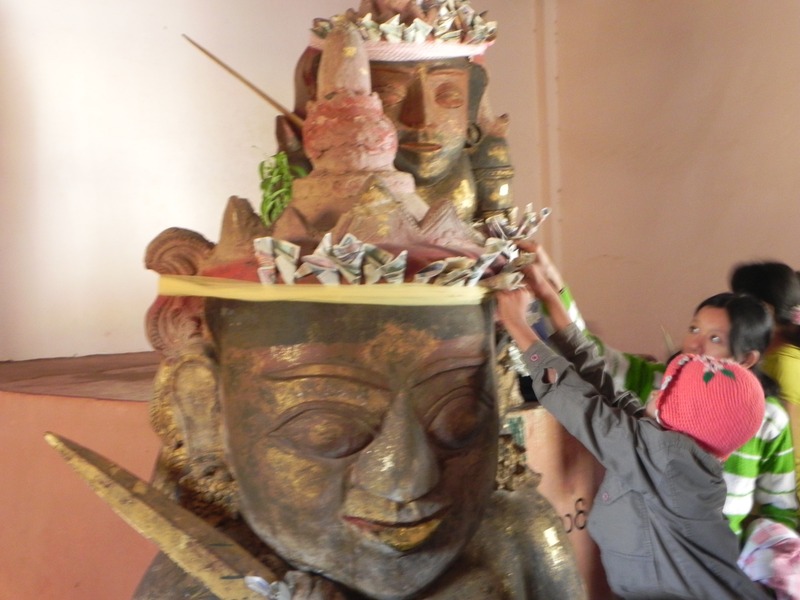 This is a religious tradition in Myanmar that predated Buddhism, and when Buddhism was introduced, many were not willing to “let go” of their worship of the spirits. 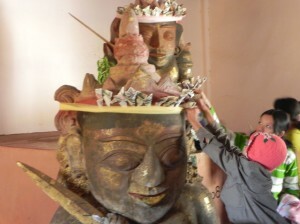 Htilominlo Temple was our next stop. Built in 1218, this temple has white stucco carving and glazed sandstone decorations, some of which have survived on the outside of the temple. It had some wonderful wall paintings inside, but photography was not allowed. 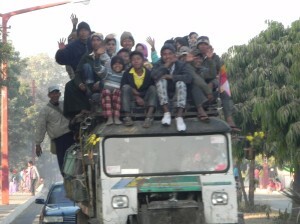 …were cramped within small spaces. 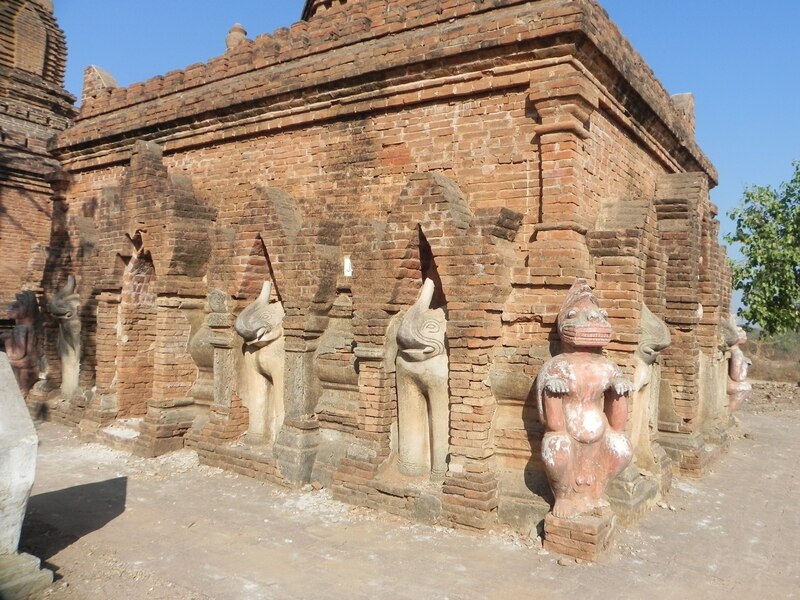 This apparently represented the discomforts experienced by the Mon King who built the temple, who had been imprisoned for a period of time. …then they dip it and dip it. 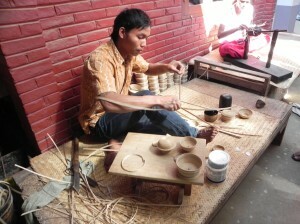 A simple soup bowl takes one month to complete. 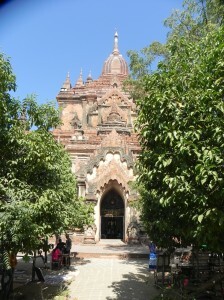 …was built in 1113 and known as the cave temple as it does not get much light. 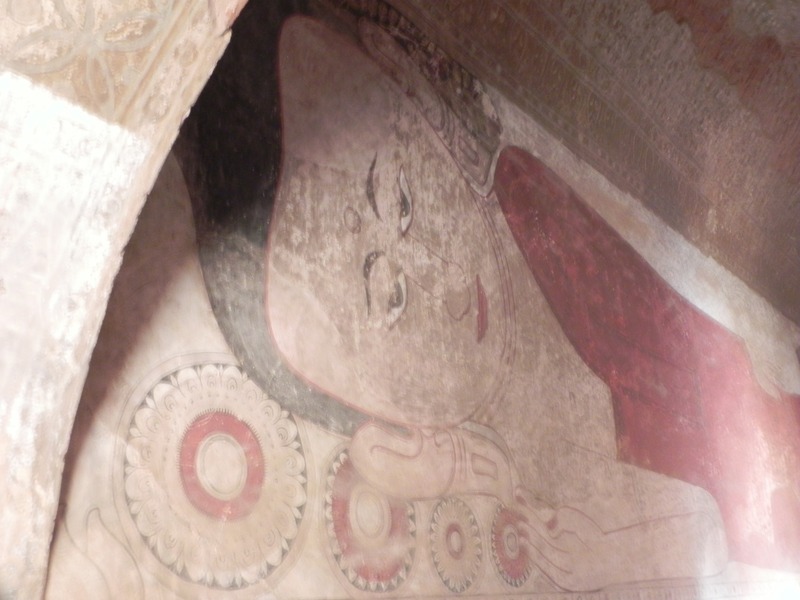 It therefore has inner walls of painted frescoes that have been well preserved, but they are hard to view in the dungeon-like interior. 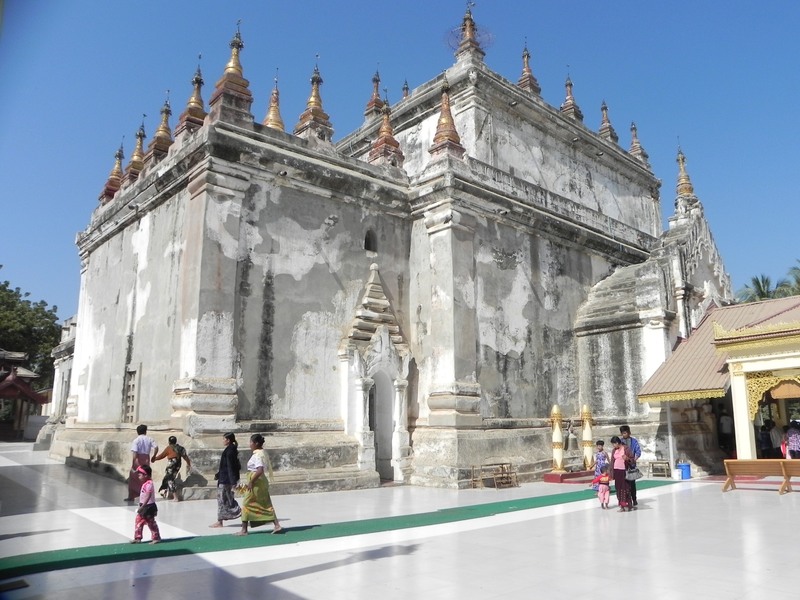 …is the largest shrine in Myanmar and was built in about 1165-70 by a King who had murdered his father and brother to attain the throne; thus the large size of the building was to atone for his sins. 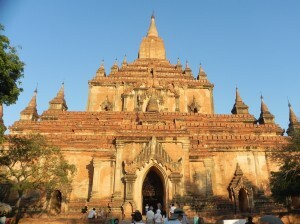 On our second day in Bagan, we will explore more of the architectural wonders of this ancient city by bike! 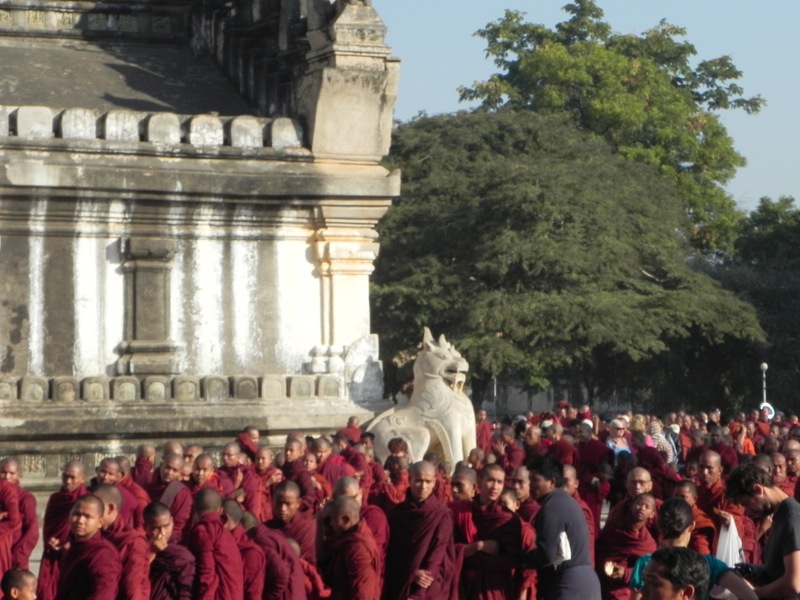 1 Response to "The Ancient City of Bagan – Myanmar – January 2013"
Some great photos Dottie, especially the Buddhist Monk with the i-Phone. Twisted humor like mine!